Meathead Movers is here to take care of the heavy lifting for you on your move to Sacramento. Our clean-cut student athlete movers are ready to get you safely settled into your new Sacramento home. As the capital of California, it is no wonder that Sacramento is one of the best places to move to in the entire state. With a rich cultural history and progressive atmosphere, there is much to be gained by moving to this thriving metropolis in California’s Central Valley. However, when making the decision to relocate, it is important to have the right Sacramento movers in place to make the transition seamless and enjoyable. Although the area had been occupied by Native Americans for years, Sacramento was first established in 1839 by two Swiss immigrants. The town grew quickly and was chosen as the state capital in 1854. Today, Sacramento continues to attract people from all walks of life thanks to its colorful history and eclectic cultural appeal. Many people enjoy Old Sacramento, which features cobblestones and buildings from the city’s early days. The city is also home to several schools including Sacramento State University. There are plenty of museums and performance centers and the city is also the home base for the Sacramento Kings basketball team. While there are many options available for Sacramento movers, none can compare to the quality and professionalism of Meathead Movers. Meathead Movers is a full-service moving company based in California. We are fully capable of supporting clients through the entirety of the moving process. Because no two moves are the same, we have flexible services. Clients can choose between local, long-distance, commercial, and on-site moving and much more. We even offer clean and affordable storage options in addition to a reliable packing service and our distinctive moving concierge service which connects you with local service providers. While our services are clearly impressive, other movers may offer similar options. However, Meathead Movers stands out because of its unique touches. We offer support any day of the week and have fixed prices on long-distance moves with no consolidated trucks. Additionally, we hire only dedicated student-athletes, making our employees fit, active, and eager. All our movers are smoke and drug-free, and are regularly active in the community. In fact, Meathead Movers is also known for its unique HUSTLE, which means that movers jog when they are not carrying anything. Ultimately, sorting through the options for Sacramento movers is simple. 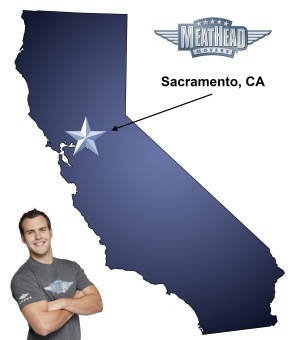 In order to help clients transition to Sacramento, Meathead Movers does the heavy lifting for you. To learn more, contact Meathead Movers for a free moving quote today. With our 100% satisfaction guarantee, the only thing you have to lose is the stress that comes from moving! Moving to Sacramento? Here are some helpful resources. Everything was done well and very fast! I would highly recommend to anyone!!! Absolutely the best moving experience ever. Quality staff and great follow up. Wish they had a branch in Sacramento.